Filing an insurance claim for roof repairs due to storm damage can be a difficult and confusing process. Is your insurance adjuster offering a fair settlement? 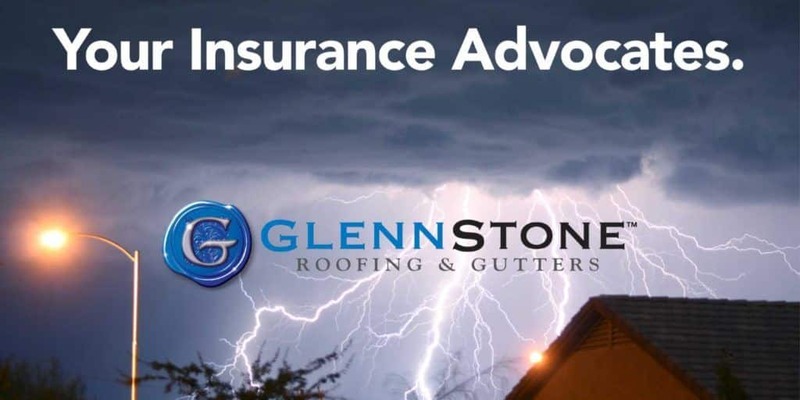 Whether you’re dealing with hail damage, wind damage, or a leaking roof, let GlennStone be your advocate for dealing with your insurance company. When your home falls victim to Mother Nature, we recommend that you call GlennStone first. We will provide you with detailed roof inspection reports. You never want to file a claim that you don’t need. If the insurance company adjuster comes to check out the situation and finds it’s not as bad as reported, you can get hit with a “false claim” on your record. Beware of roofing companies that are willing to refer to everything as storm damage to get your business. Disreputable contractors may be willing to exaggerate the extent of storm damages or offer to cover your deductible expense in an attempt to gain your business. This practice is not only unethical but also insurance fraud and a felony offense – that’s a liability you don’t need. And unfortunately, a lot of potential claims that some companies label as “wind damage” are actually due to shingles that were not originally installed properly. At GlennStone, we always call it as we see it. We have developed an excellent reputation with the local insurance adjusters. We would be happy to meet with your insurance adjuster on your behalf to discuss the damage we’ve discovered (not invented) on your roof and use our professional expertise to clearly communicate the extent of those damages and the cost of repairs. Our strong rapport with the insurance companies helps your claim move through the system more smoothly. After a storm, you may find your roof suffering from hail damage, wind damage, or a leaking roof – or perhaps all of the above! While these sorts of damages can necessitate very costly repairs, as a homeowner, you won’t need to worry. The maximum out-of-pocket expense a homeowner should ever have on an insurance claim is the amount of the deductible. Typically, the only exceptions include instances in which a homeowner requests upgrades in material, has defective decking, or has an Actual Cash Value (ACV) insurance policy in place. We pride ourselves on making the insurance claim process as painless as possible. We will explain every line item and give you options on how best to proceed. We have an excellent reputation and work with all major insurance companies in handling storm damage caused by hail, high winds, snow, sleet, and more. Let us use our years of experience in this field to help with your insurance claim. Please click here to request our help with an insurance claim.